The seventh of eight children of Polish immigrant parents, the Pennsylvania native excelled both as player and coach in professional football. After graduating from Washington and Lee College in Virginia, where he played fullback, guard and linebacker, Michaels (brother of Lou, NPASHF 1994 inductee) played 11 seasons (1951-1961) and coached for 20 years (1962-1982). He was linebacker on a pair of NFL championship teams and five division winners for the Cleveland Browns, and was named to four straight Pro Bowls (1957-1960). Michaels was the secondary and linebackers coach for the 1969 New York Jets that pulled a stunning upset of the Baltimore Colts in Super Bowl III. In 1972, he started a 10-year stretch as head coach of the Jets, being named Coach of the Year in 1978 and leading the team to the 1982 AFC championship game. In pro football there have been many great players and many great coaches, but there have been very few who have excelled at both. One of them is Walt Michaels, an All-Pro linebacker who later became an NFL Coach of the Year. The seventh of eight children of Polish immigrant parents, Michaels was born on October 16, 1929 in Swoyerville, Pennsylvania. Teachers in school anglicized the family name from Majka to Michaels. Walt knew how to hit – and he became a very successful football player. He earned a scholarship to Washington and Lee College in Virginia, where he played fullback, guard and linebacker while earning a B.A. in psychology and education. 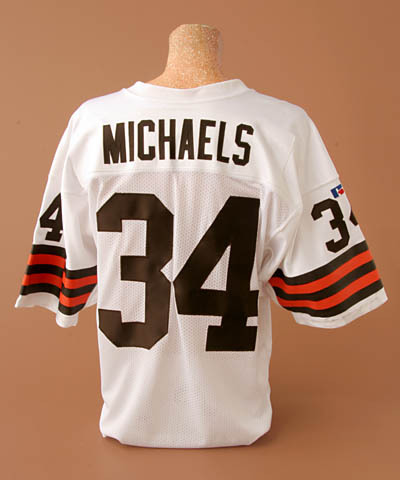 Michaels was drafted in the seventh round of the 1951 draft by Cleveland, who later traded him to Green Bay. The Browns reacquired him in 1952 for three players and he became a starting linebacker. Michaels was one of Coach Paul Brown’s most reliable defenders for the next decade, and a leader of one of the NFL’s top teams. Renowned for his toughness, Walt missed just two games despite suffering a variety of injuries. The 6-foot, 230-pound Michaels played on a pair of NFL championship teams for the Browns, as well as five division winners. He was also named to four consecutive Pro Bowls from 1957 to 1960. Walt began his coaching career in 1962 as a defensive line coach with the Oakland Raiders. The following year he took a similar position with the New York Jets under Weeb Ewbank, who had been an assistant coach with the Browns. When three of the Jets’ four linebackers were injured prior to the opening game of the 1963 season, Walt came out of retirement. Remarkably, he played the entire game even though he had not even practiced in two years. Michaels then hung up his cleats for good and began making his mark as a coach, helping build the Jets defense and developing such outstanding players as Gerry Philbin, John Elliott and Verlon Biggs. His defenses showed the same kind of tenacity and toughness that Walt displayed as a player. In 1967, Michaels took over the secondary and linebackers, and the Jets’ defense evolved into one of the best in the AFL. In 1969 the Jets won the AFL championship, earning the right to play in Super Bowl III. Although Quarterback Joe Namath received most of the credit when the Jets defeated the Baltimore Colts, Michaels and his defensive players had a crucial role in the 16-7 victory, which is still considered one of the game’s greatest upsets. The Jets secondary, with four free agents, intercepted four Colts passes and the defense held Baltimore scoreless until the last four minutes of the game. Walt left the Jets in 1973 to become defensive coordinator for the Philadelphia Eagles. He rejoined the Jets in 1976 when Lou Holtz became head coach. When Holtz resigned after 13 games, Michaels became head coach of the Jets at age 52. In 1977 the Jets did not improve on their 3-11 record of the previous season, but they did start to play aggressive, physical football. In 1978 the team made the biggest improvement of any team in the NFL by posting an 8-8 record. New York, which was in playoff contention until an overtime loss to Cleveland in week 15, had its most wins since 1969. Walt was named NFL Coach of the Year by Pro Football Weekly and other publications. In the strike-shortened 1982 season, Michaels led the Jets to the AFC Championship Game with upsets on the road over the Cincinnati Bengals and Los Angeles Raiders. However, they lost to the Dolphins in the rain-soaked Orange Bowl, 14-0. Despite the Jets’ relative success, Walt was fired following the 1982 season. He returned to coaching in 1984 with the New Jersey Generals in the short-lived USFL. He turned around the perennial losers, taking the Generals to the playoffs in both of his seasons and winning 24 of 36 games. Since leaving coaching he has been involved in various activities, including a stint as a TV football commentator. In addition, he enjoyed the chance to spend time with his children (he and his wife, Betty, have a daughter and three sons). Walt also took some time off following successful surgery to remove a tumor in his neck several years ago. Walt Michaels will long be remembered as one of the NFL’s great players and coaches, as well as one of the toughest men to ever step on a football field. Super Bowl III presented a dilemma for Walt Michaels’ mother, Mary, who was named NFL Mother of the Year in 1966. While Walt coached the Jets, younger brother Lou was a defensive lineman and place-kicker for the Baltimore Colts. That turned out to be the winning side, as Walt’s defense stymied the heavily favored Colts and the Jets pull off a stunning 16-7 victory.